What does 4×4 recall in your mind? An Off-road vehicle? Off-road may be just an approximation this time, however, not in a physical but musical way. Babylon Soundgarden takes its fourth run in Parkorman Maslak Istanbul on 24 May 2014 as one of four festivals going to take place in Istanbul, Ankara, Bodrum and Cesme. The diverse programme includes a lot of options to enjoy different genres. EDHID’s favourites are Barcelona’s Oriol Riverola alias John Talabot, Mount Kimbie, Joystick Joy, FM Belfast, AH! Kosmos and Ali Gültekin. This year’s festival implements also an environment friendly concept called “Babylon goes green”. Sneakers on, all set, let’s take a selective view on the artist before we are ready to dance! If you missed John Talabot’s DJ Set in January at Babylon with Berlin-based !K7 Records’ DJ Kicks tour, this is a great chance for listen to Barcelona’s creative mind who used to be a Resident DJ of Razzmatazz and occupies a firm corner of our heart since his international debut “Sunshine” in 2009 and his timeless album fIN from 2012. Don’t worry if you cannot spell the names of FM Belfast’s members Lóa Hlín Hjálmtýsdóttir, Árni Rúnar Hlöðversson, Árni Vilhjálmsson and Örvar Þóreyjarson Smárason. Founded in 2005, the band made its debut with their live performance at Iceland Airwaves Festival one year later. Based in Reykjavik, FM Belfast invites you to their unique blend of electro-influenced Pop and Indie with a Icelandic touch. Make Dominic Maker and Kai Campos a.k.a. 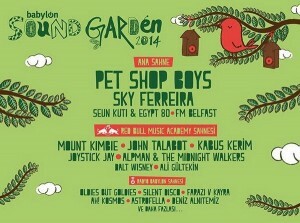 Mount Kimbie Turkey debut a very special one at Babylon Soundgarden 2014. Being on the radar since 2009, the duo blows up the dust on the world’s dance floors and festivals like Great Escape Festival, Bestival, SXSW and Coachella among others. P.S. I’am big fan of the Hamburg-based DJ Koze Remix of their track “Made to Stray”. Oslo-born Joystick Jay has a predilection to discover lost, dusty, weird-sounding psychodelic funk and soul from all over the world and revamping them with a heavy dose of disco. Early support from Todd Terje, DJ Harvey and Gilles Peterson has its valid reason, so check him out. Join Basak Günak in her research of how music waves bounce of the walls and between bodies. She played already several festival like Berlin’s CTM, Venice’s Electro Festival, Rock’n Coke in Istanbul among others. Just back from her Italy tour in January 2014, be ready for a show setting your mind free.